• Complications From Heatstroke Deadly: Slater Springman spends 3 1/2 months in hospitals, forced into induced coma, as bills mount over $2 million. • Dark Side Of Coaching Can Be Torture Test: Arizona State’s Tracy Smith finds out how vicious fans, media can be when losses pile up. • Vital Importance Of Sleep: Dr. James Maas explains in detail what type of bed and pillow works well for long, healthy rest. • 6 Feet Of Water Covers Field: Levees break next to rivers as Midland College suffers major flood damage at park. • Demie Mainieri Dies At Age 90: Hall of Fame skipper at Miami-Dade North Community College was the first JC coach to win 1,000 games. • NCAA Div. I Notes: Coastal Carolina hits for home run cycle, Minnesota hits 11 doubles, Appalachian State freshman Luke Drumheller ties NCAA single-game record with 5 doubles, plus much more. • National Players Of The Week Powered By Diamond: Incredible numbers put up in recent action, including 5 home runs by 1B Tristan Peterson of New Mexico St., 13 strikeouts by Navy’s Noah Song, plus much more. • Collegiate Baseball’s National High School Top 30 Presented By Diamond Pro: Lake Travis H.S. (Austin, Tex.) No. 1 after rolling to 17-0 record under Coach Mike Rogers. Plus, 29 other amazing high school teams are listed across the USA along with extensive notes on all teams. • High School Notes: Boiling Springs beats AC Florida for International Paper Classic title, plus much more. • NCAA Div. 2 Notes: Tusculum pitcher Charles Hall strikes out 22 batters against Queens to set NCAA Division II single-game record, plus much more. • NCAA Div. 3 Notes: Hope College starts 2019 season with two no-hitters during first week of action, plus much more. • NAIA Notes: RHP Alec Myers of William Penn (IA) pitches perfect game, plus much more. • Charlie Greene Column: Should third baseman hold runner on bag as tactic? • Ruleball With Rich Marazzi: Deflections that go into dead ball area discussed. • Junior College Notes: RHP Jake Dykhoff of Minnesota State Community & Technical College fires perfect game with 14 strikeouts, plus much more. 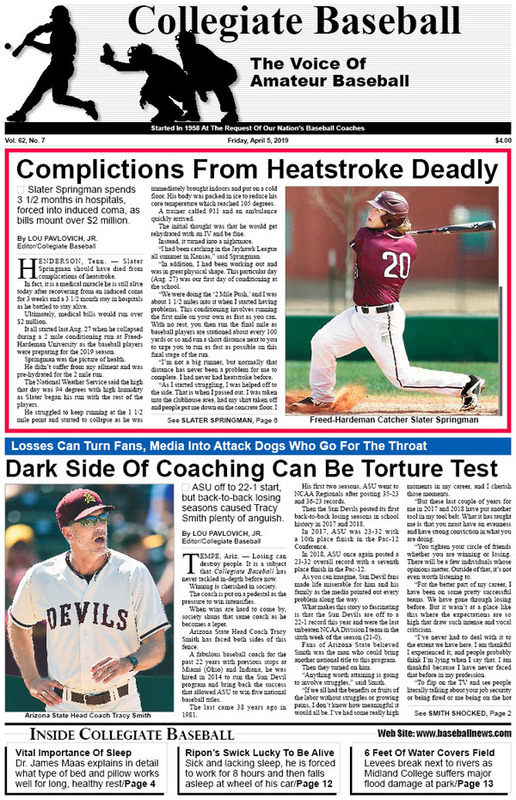 To purchase the April 5, 2019 edition of Collegiate Baseball or subscribe, CLICK HERE.